When a decaying corpse is discovered by her father’s staff as they prepare for an auction, Flavia Albia steps in to take responsibility and get the container washed hygienically. For a better view of her suspects as the bidding hots up, she takes over the gavel. I can already hear the outraged cries of hidebound traditionalists who think Roman men were men and their women stayed invisible. Albia has her own ideas of helping a family business. Meanwhile Manlius Faustus is helping an old friend stand in what passes for an election in undemocratic imperial times; he persuades Albia to help dig up dirt for spin-doctoring purposes, allowing them to marvel at the appalling candidates and see more of each other. 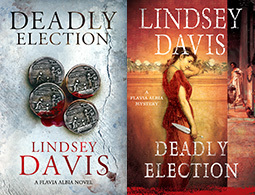 Albia soon starts to suspect a mysterious link to her corpse – but surely no one would murder a candidate or a voter; can politics be that dirty? Then where, she soon wonders, is the supposedly devoted wife of the ‘good family man’ that Faustus wants them to support? ‘Isn’t thirty-six rather old to run away from home?’ I asked.